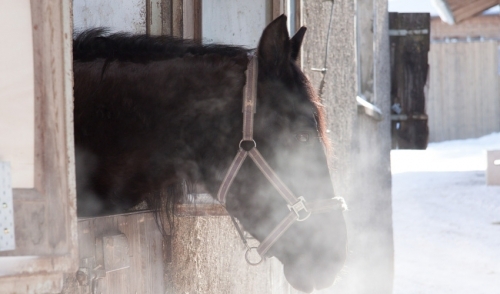 Share "Winter May Mean Increased Respiratory Problems for Horses"
Cold temperatures and brisk winter air may be refreshing for a deep breath or brief outdoor walks, but winter leads to many air quality issues that can create severe respiratory problems in horses, particularly in barns. While barns may keep horses safe and warm in the winter, poor ventilation can lead to a range of health concerns. Fortunately, there are several ways to improve winter air quality and keep horses breathing easy. When respiratory problems go untended, horses may develop pneumonia or other severe problems, such as a heave line in their abdominal muscles. While individual symptoms can be treated, if the underlying poor air quality is not addressed, the horse's wind and lung capacity may be dramatically reduced and it could take weeks or months to recover. Improving overall ventilation by opening windows a crack and using ceiling fans and duct filters to remove airborne particles. Storing winter hay supplies in a building or shed separate from the horse barn so moving the hay does not create more dust that will settle in the barn. Offering horses low-dust pellet feed with hay built in rather than loose hay that will generate more particles. Soaking hay before offering it to horses to remove as much dust as possible, and feeding hay low to the ground rather than from overhead bins. Mucking out stalls as frequently as possible, ideally each day, to minimize ammonia buildup in the barn's air. Providing turn out time in paddocks and corrals as frequently as possible, especially when barn chores may be raising more dust. The most effective way to control winter barn air quality is to use multiple techniques and carefully monitor horses for any signs of respiratory distress or discomfort. When breathing irregularities are noticed, it is imperative to seek veterinary help as soon as possible for proper diagnosis and treatment before long term problems develop.